So who says fairy tales do not come true. They did for Todd and I. It has been a long long road to staying together and being happily married is no picnic either. Marriage is a lot of work. Years ago, twelve to be exact in 1997 I arrived in Philadelphia as a Aupair. I took care of two kids. A newborn and an 18 month old. 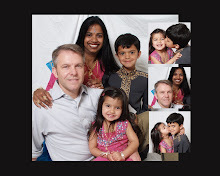 The dad was Indian and the mom was American so the kids were a great mixture like my kids are. I was at a park and so was Todd. I did not know him off course. The little girl was going through a phase of throwing away her shoes like most kids do. I worked for a rich family so the shoes were expensive and were from Nordstrom's. I was warned that no more shoes could be lost. On that day she threw away her shoe and Todd found it. He followed me down the street as I rushed on my way to bring them home for a nap and a bottle for the baby. I was late and needed to race back to the house. Todd handed me the shoe and said " your daughter lost her shoe " I made it clear that she was not my child and that I was single. He handed me his business card and asked me to call him.I thanked him and walked on and did not think about that for a while. I told another friend of mine about what happened and she said that I should call him. Well I was not allowed to talk to guys never mind call them. I was quickly reminded that I was 10 000 miles away from home and my culture and I should enjoy life and my new found freedom. My friend really wanted to go to an adventure park called Dorny Park which was about 2 hours away. We did not drive so we needed someone to take us. She exhausted the list of people we knew with cars and then she suggested I call Todd. I did and our first conversation was more than five hours long. He agreed to take us to the park and also brought his room mate along to hang out with my friend. There was instant chemistry between us for sure but I knew that it was a one day thing. boy was I wrong. We dated and there were so many obstacles along the way. Immigration, Atlantic Ocean when I had to leave for England and then the Atlantic Ocean when I left England to go back to South Africa. Well that is a whole other story and too long to talk about today. So we met with a shoe just like Cinderella. Cinderella will always be my favorite princess. Well on Friday night while trick or treating I has Priyasha in the wagon and Pravan ran ahead of us. 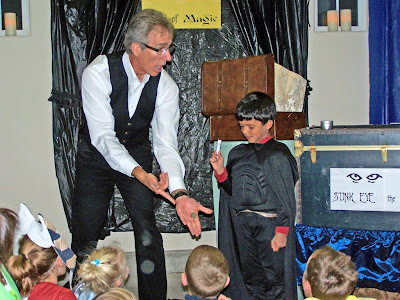 We stopped at a magic show that one of the neighbors put on on halloween night. Priyasha did great but finally she asked to go to the bathroom and we were at some body's house. I did not know them but they lived on the other end of my street. They let Priyasha use the bathroom. There were so many kids racing to the doors and there was so much excitement. I warned Pravan to stay where he was at the front door and not to go to the next house without me. He listened well but when I got back he was so excited.
" 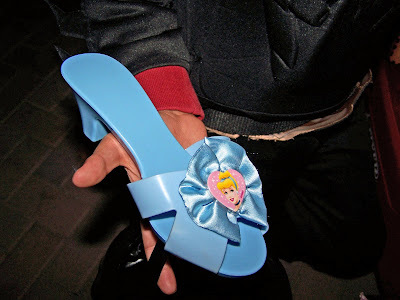 Mommy I found Cinderella's shoe " He showed it to me and I was so amused. I laughed and took pictures of it. He then said " Cinderella's name is Taylor " He knew who it belonged to so we did not have to send the kings men to all the houses and have every little girl try on the shoe. As we walked down the drive way the mom was carrying her little girl that was crying. 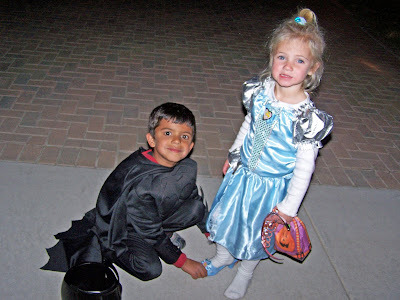 Pravan put the shoe on her feet and she was happy again.Taylor is the sister of a little boy that is in Pravan's class. Isn't she beautiful. Well Pravan has never played with her before and I am not expecting any kind of ending with this. It was so magical for him and I could hardly contain my excitement and amusement. Here are some pics for you to see the story that happened. 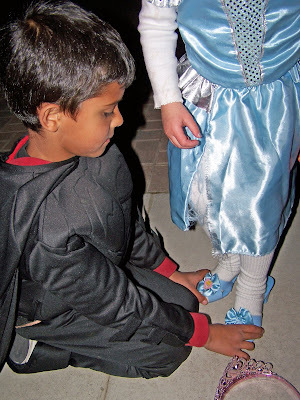 A real Cinderella story on Willow Ranch Trail. There was no prince just batman. So a small twist but a great one. 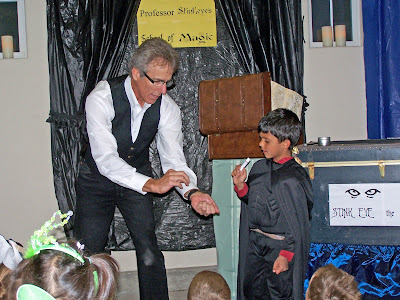 Pravan loved helping with this trick. 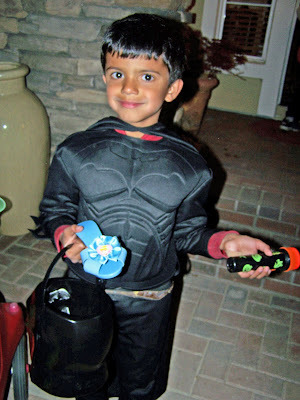 They got a goodie bag with two tricks in it and Pravan has spent a lot of time practicing it. Well these two will live happily ever after but maybe not together. Tracy your daughter is beautiful and some day her Prince will really come and sweep her off her feet and when that day happens remember that you will not loose your daughter you will gain a son.From one mom to another I hope it is not too soon. Thanks for loaning Cinderella to us for the moment ! this was a wonderful story! I would love to hear yours, from the states, to england, to south africa??? must be a wonderful story. And I am glad also that you said your fairy tale came true BUT that marriage is hard work. Because thats exactly what it is. And so very rewarding too. wouldn't it be the funniest thing ever if in 20 years, Pravan married her!!!! sigh, that is the romantic in me talking.